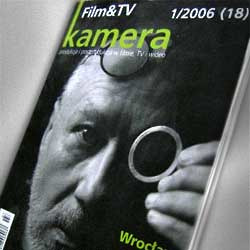 An interview in "Film & TV Camera"
An interview with Tomasz Siwiński was published in a polish trade film magazine "Film & TV Camera". It was connected with the award which Tomasz Siwiński received for the film "TV-set" during the Polish National Festival of Original Animated Films (OFAFA) in 2005. The interview was conducted by Irena Gruca-Rozbicka.